(1) S'rî Sûta said: "After Mahârâja Parîkchit, the one protected by Vishnu, had heard what was said by the sage, the equal minded seer of the Supreme Soul, the son of Vyâsa, he approached his lotus feet, bowed his head down and said with his hands folded the following to him. (2) The king said: 'With the great mercy shown by your goodness full of compassion, I have attained perfection because you described directly to me the Lord Without a Beginning or End. (3) It is no surprise at all for great souls absorbed in the Infallible One to be of mercy with the ignorant conditioned souls who are tormented by distress. (4) We [thus] heard from you this collection of classical stories in which the Supreme Lord Uttamas'loka is being described [*]. (5) My lord, I do not fear Takshaka or any other living being, nor do I fear repeated deaths; I have entered the Spirit of the Absolute revealed by you as [nirvâna, as] standing apart from everything material, and [am now] free from fear. (6) Please allow me oh brahmin, to place my speech [and other sensory functions] in Adhokshaja so that I, with an absorbed mind having forsaken all sensual desires, can give up my life. (7) With the help of you who showed the all-auspicious, supreme shelter of the Lord Almighty, I have become fixed in non-material knowledge and wisdom and has my ignorance been eradicated.' "
(21) Hearing that the priests performed the ritual for offering Takshaka along with Indra. [They prayed:] 'Oh Takshaka, may you quickly fall into this fire here together with Indra and his host of demigods.' (22) Indra who together with Takshaka and his vimâna was thrown from his position by the derogatory words of the brahmins, became most disturbed. (23) Brihaspati, the son of Angirâ, who saw him together with Takshaka fall from the sky in his vimâna, addressed the king: (24) 'This snake-bird does not deserve to be killed by you, oh ruler of men. He, this king of the snakes, drank from the nectar [of the gods] and is therefore beyond any doubt free from aging and immortal! (25) The life and death of a living being and his destination [in a next life], oh King, are solely the result of his karma; no other agent than this brings him happiness and distress. (26) A living being dying because of snakes, thieves, fire and lightening, hunger, thirst, disease or other agents oh King, undergoes that because of his accumulated karma. (27) For that reason oh King, this sacrifice should be stopped that is performed with the intent to harm others. People burning innocent snakes will have to suffer that fate themselves [see also the Mahâbhârata 1.43].' "
(28) Sûta said: "Thus being addressed he said: 'So be it! ', and with respect for the words of the great sage he ceased with the snake sacrifice and worshiped that master of speech [Brihaspati]. (29) It is this great material illusion [mahâmâyâ] belonging to Vishnu that, because of the interaction of the material qualities [the gunas], causes misfortune, cannot be counteracted and from which the souls who are part and parcel of Him become bewildered and are caught in material bodies. (30-31) The visible illusory energy wherein abiding one lacking in peace thinks in terms of deceit, will not [prevail] when one constantly investigates what goes on in the soul. This is so because one therein, [in that state] the transcendentalists speak about, is not of the materialistic arguments that assume so many forms nor thereof is of a mind full of decisions and doubts. In that [transcendental consciousness] the living entity is not of worldly concerns or of their causes and the benefits achieved by them, nor is he therein of the I-awareness [that is so strong] in being bound to the modes. That is all excluded then. A wise soul should take pleasure in warding off the waves of worldly conditioning as also anyone thus being entangled [see also e.g. 6.4: 31-32]. (32) The supreme refuge of Lord Vishnu is, by those who wish to give up everything inessential, designated as that what is 'neither this, nor that' [see also neti neti]. Rejecting the immorality [of materialism] and with their emotions directed at nothing else, they embrace in their hearts the 'not-that' [of the Soul, of Him] to which they hold on deeply absorbed in meditation [in samâdhi]. (33) [Thus] not being corrupted by the 'I' and 'mine' that is based upon having a body and a home, they attain this supreme refuge of Lord Vishnu. (34) Insulting words one should tolerate and one should never disrespect anyone, nor should one identify with this material body or hold a grudge against whomever. (35) I offer my obeisances to Him, the Supreme Personality of Godhead S'rî Krishna whose knowledge is always new and upon whose lotus feet meditating I have assimilated this collection of wisdom [Samhitâ]'." (36) S'rî S'aunaka said: "Please tell us this oh gentle soul [Sûta]: in what way spoke Paila and the other highly intelligent disciples of Vyâsa who constitute the Vedic authority, about the Vedas and how have they divided them?" (37) Sûta said: "Oh brahmin, Lord Brahmâ, the most elevated being, had his mind perfectly under control and heard in his heart the subtle transcendental sound [of ta-pa, 2.9: 6] that arose from the ether. One can hear that sound when one closes one's ears [for sounds from the outside. See also s'abda]. (38) By the worship of that sound, oh brahmin, yogis cleanse the contamination away from the heart that is known as the substance, the activity and the doer [**], and find liberation from rebirth. (39) From that [sound] the threefold omkâra [A-U-M] came into being that, manifesting itself unseen, constitutes the representation of the Supreme Lord [Bhagavân], the Absolute Truth [Brahman] and the Supersoul [Paramâtmâ, see also 1.2: 11, B.G. 7: 8]. (40-41) One perceives this [eternal, itself imperceptibly manifesting] sound, outside the physical sense of hearing and power of vision. 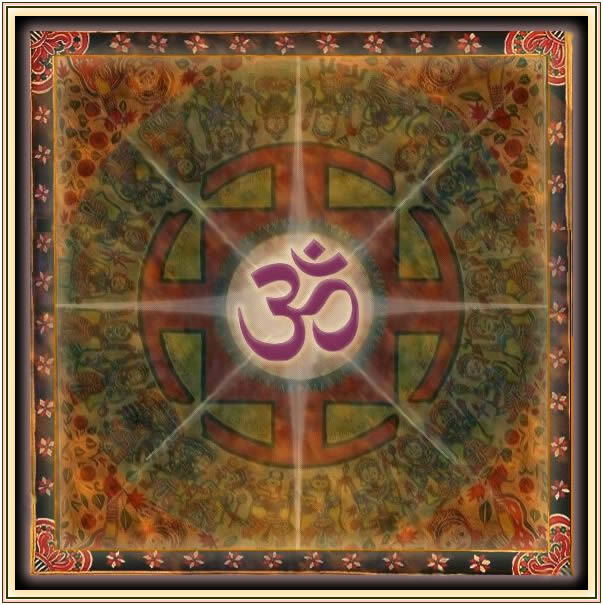 The complete of the Vedic sound one employs is an elaboration of this omkâra that from the soul manifests itself in the ether. It constitutes the direct expression of the self-generating Absolute Truth and Supersoul, it constitutes the eternal seed of the Vedas and constitutes the secret of all mantras [see also 7.15: 31, 9.14: 48, 11.14: 34-35, 11.21: 36-40]. (42) Oh eminence of Bhrigu, the three sounds of the alphabet beginning with A that came into being [the sounds A, U and M], are fundamental to [all] the threefold forms of material existence: the modes [the gunas], the names [of the three Vedas], the destinations [the three types of lokas] and the states of consciousness [avasthâtraya]. (43) The mighty unborn Lord [Brahmâ] created from it [that threefold sound] the different sounds of the total collection of vowels, sibilants, semivowels and consonants as they are known by their short and long forms. (44) For the purpose of giving instruction on the four sacrifices [see ritvik], the almighty one created with all these sounds from his four faces the four Vedas, along with his omkâra and vyâhriti invocations [of the names of the seven lokas]. (45) He taught them [as a complete set] to his sons who were the great rishis among the brahmins most expert in the art of Vedic recitation, and they in their turn imparted them as instructors of dharma [âcâryas] to their sons. (46) Throughout the four yugas generation after generation, one after the other disciple fixed in his vows received them [these Vedas] by disciplic succession [paramparâ]. 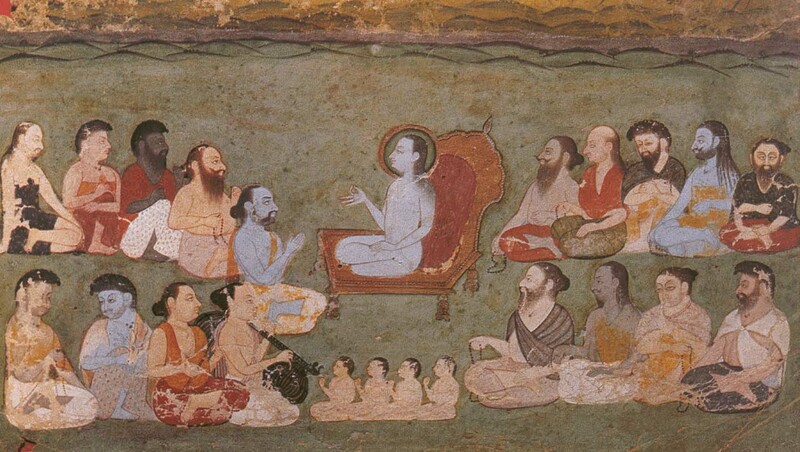 They were divided among the prominent sages at the end of Dvâpara-yuga. (47) The brahmin sages, inspired by the Infallible Lord situated in their hearts, came to that dividing among each other of the Vedas when they saw that under the influence of time the intelligence [of the people] diminished, the life span shortened and the strength weakened [see also 1.4: 16-18]. (48-49) Oh brahmin, in this period [of Manu], Brahmâ and S'iva and other rulers over the worlds requested the Supreme Lord, the Protector of the Universe, to protect the principles of religion. Oh most fortunate soul, the Lord [in the form of Krishna Dvaipâyana Vyâsa], by Parâs'ara begotten in the womb of Satyavatî, then descended as a partial expansion of His plenary portion [Sankarshana] and divided the Veda in four. (50) Like someone sorting out gems, he separated the group of mantras in four categories of collections [Samhitâs]: the Rig, Atharva, Yajur and Sâma Veda [see Vedas]. (51) The highly intelligent and mighty sage, asked four of his disciples to approach him one by one, oh brahmin, to give each of them one of the [four] collections. (52-53) He taught Paila the first collection [the Rig Veda] named Bahvrica ['many verses'], to Vais'ampâyana he spoke the collection of Yajur mantras called Nigada ['the recited'], the Sâma mantras titled Chandoga ['singer in metre'] he told Jaimini and the [Atharva] mantras from [the sages] Atharva and Angirâ he entrusted to his dear disciple Sumantu [see also 4.21: 22]. (54-56) Paila told his Samhitâ [that he divided in two] to Indrapramiti and Bâshkala. The latter one oh son of Bhrigu [S'aunaka], divided his collection in four parts he handed down to his disciples Bodhya, Yâjñavalkya, Parâs'ara and Agnimitra. The self-controlled sage Indrapramiti taught his collection to the learned seer [his son] Mândûkeya and his disciple Devamitra taught it to Saubhari and others. (57) S'âkalya, his son, divided his collection in five parts he gave to Vâtsya, Mudgala, S'âlîya, Gokhalya and S'is'ira. (58) Sage Jâtûkarnya, also a disciple of his added to the collection he received a glossary when he passed it down to Balâka, Paila, Jâbâla and Viraja. (59) Bâshkali [the son of Bâshkala] assembled from the different branches [of the Rig Veda] the collection called the Vâlakhilya-Samhitâ that was received by [the daitya sons] Vâlâyani, Bhajya and Kâs'âra. (60) This is how those many collections of the Rig Veda verses were maintained by these brahmin seers [in disciplic succession]. Anyone who hears about the distribution of these sacred verses is freed from all sins. (64-65) The son of Devaratâ then regurgitated the collected Yajur mantras. After he had left the sages greedily looked at these Yajur mantras and turned into partridges picking them up. These branches of the Yajur Veda thus became known as the most beautiful Taittirîya-Samhitâ ['the partridge collection']. (66) Oh brahmin, Yâjñavalkya, looking for extra mantras unknown to his spiritual master, thereupon carefully worshiped the Lord of the sun. (67) S'rî Yâjñavalkya said: 'My obeisances unto the Supreme Personality of Godhead, who, appearing as the sun and just like the ether in the form of the Supersoul inside and in the form of Time outside, is present in the hearts of the four kinds of living entities beginning from Brahmâ down to the blades of grass [as born from wombs, eggs, moist and seed, see also 2.10: 37-40]. You who cannot be covered by material terms, all by Yourself, with the flow of years made up of the tiny fragments of kshanas, lavas and nimeshas [see 3.11: 7], carry out the maintenance of this universe by taking away and returning its water [in the form of rain]. (68) Oh Lord of the Sun, oh Glowing One, oh Best among the Gods, by the rules of the sacred tradition I daily meditate, at the [three] junctures of the day, with full attention on Your glowing sphere, on You the mighty controller, who burn all the sins, the consequent suffering as also what led to them, of all souls offering prayers [see also 11.14: 35 and the Gâyatrî]. (69) You, who in this world are the Lord dwelling in the hearts of all the moving and nonmoving living beings depending on Your shelter, awaken [and inspire] their unconscious material mind, senses and different vital airs [the vâyus]. (70) This world was seized and swallowed by the horrible mouth of the python known as darkness and became unconscious like being dead. You alone, most magnanimous mercifully casting Your glance, awaken [the sleeping souls] with the gift of insight. At the beginning, half way and at the end of the day You thus, day after day engage [the pious] in the ultimate benefit known as one's own nature of delivering service in a spiritual existence [svadharma]. (71) Like an earthly king You [in the form of the sun] travel around everywhere creating fear among the sinners while the deities of the directions holding lotus flowers, with folded palms offer their respects. (72) Hoping for Yajur mantras not known to anyone else, I therefore with prayer approach Your two lotus feet, oh Lord, that are honored by the spiritual masters of the three worlds [lokas, and see 5.23: 8].' "
(73) Sûta said: "He, the Supreme Lord of the Sun thus glorified being satisfied, assumed the form of a horse and presented to the sage the Yajur mantras that were never learned by any other mortal being [see also 5.18: 6]. (74) The mighty sage divided the hundreds of Yajur mantras in fifteen branches that were accepted by the disciples Kânva, Mâdhyandina and others under the name Vâjasaneyi: 'stemming from the manes of the horse.' (75) Of Jaimini Rishi, the manager of the Sâma Veda, there was a son Sumantu as also a grandson Sutvân. Each of them he told one half of the collection. (76-77) Sukarmâ, another disciple [of Jaimini] and great thinker, divided the tree of the Sâma Veda into a thousand collections of Sâma mantras after which, oh brahmin, the disciples Hiranyanâbha - the son of Kus'ala - Paushyañji as also another one named Âvantya who was most advanced in spiritual realization, took charge of them. (78) From Paushyañji and Âvantya there were five hundred disciples who are called the Sâma Veda singers of the north, or also [in later times, some of them] the singers of the south. (79) Laugâkshi, Mângali, Kulya, Kus'îda and Kukshi, [five] other disciples of Paushyañji, each took care of a hundred collections of mantras. (80) Krita, a disciple of Hiranyanâbha, communicated twenty four Samhitâs to his disciples and the remaining ones were handed down by the self-realized sage Âvantya." Third revised edition, loaded November 1, 2015. S'rî Sûta said: "After Mahârâja Parîkchit, the one protected by Vishnu, had heard what was said by the sage, the equal minded seer of the Supreme Soul, the son of Vyâsa, he approached his lotus feet, bowed his head down and said with his hands folded the following to him. The king said: 'With the great mercy shown by your goodness full of compassion, I have attained perfection because you described directly to me the Lord Without a Beginning or End. It is no surprise at all for great souls absorbed in the Infallible One to be of mercy with the ignorant conditioned souls who are tormented by distress. We [thus] heard from you this collection of classical stories in which the Supreme Lord Uttamas'loka is being described [*]. My lord, I do not fear Takshaka or any other living being, nor do I fear repeated deaths; I have entered the Spirit of the Absolute revealed by you as [nirvâna, as] standing apart from everything material, and [am now] free from fear. Please allow me oh brahmin, to place my speech [and other sensory functions] in Adhokshaja so that I, with an absorbed mind having forsaken all sensual desires, can give up my life. With the help of you who showed the all-auspicious, supreme shelter of the Lord Almighty, I have become fixed in non-material knowledge and wisdom and has my ignorance been eradicated.' "
Sûta said: "Thus having been addressed the powerful saint, the son of Vyâsa, gave him the permission. After the king, that god among the people, along with the renounced sages had worshiped him, the sage left. Parîkchit, the saintly king, by the power of reason thereupon placed his mind in his soul, meditated on the Supreme Truth and arrested his breath so that he became as motionless as a tree. On the bank of the Ganges sitting on darbha grass laid to the east, the great yogi, facing the north, broke in perfect realization of the Absolute Spirit with all doubts. Dear scholars, when Takshaka, being triggered by the angered son of the brahmin sage [Samika], was on his way to kill the king, he encountered Kas'yapa Muni [see 1.18]. He was an expert in countering poison, but Takshaka satisfied him with valuables and persuaded him to return home. Thereupon he, able to assume any form desired, disguised himself as a brahmin and bit the king. Before the eyes of all embodied souls the body of the fully self-realized saint among the kings was consumed by the fire of the snake's poison and turned immediately to ashes. From all directions of the earth and the sky a great cry of lamentation was heard of the surprise of all demigods, demons, human beings and other creatures. The kettledrums of the demigods resounded, the Gandharvas and Apsaras sang and the self-realized souls spoke words of praise and rained down a shower of flowers. When Janamejaya heard that his father had been bitten by Takshaka, he most enraged accordingly together with the brahmins offered all the snakes [of the world] as oblations in a sacrificial ceremony. Takshaka seeing the great serpents being burned in the blazing fire of the snake sacrifice, agitated by fear went to Indra for shelter. Indra who together with Takshaka and his vimâna was thrown from his position by the derogatory words of the brahmins, became most disturbed. 'This snake-bird does not deserve to be killed by you, oh ruler of men. He, this king of the snakes, drank from the nectar [of the gods] and is therefore beyond any doubt free from aging and immortal! The life and death of a living being and his destination [in a next life], oh King, are solely the result of his karma; no other agent than this brings him happiness and distress. A living being dying because of snakes, thieves, fire and lightening, hunger, thirst, disease or other agents oh King, undergoes that because of his accumulated karma. For that reason oh King, this sacrifice should be stopped that is performed with the intent to harm others. People burning innocent snakes will have to suffer that fate themselves [see also the Mahâbhârata 1.43].' "
Sûta said: "Thus being addressed he said: 'So be it! ', and with respect for the words of the great sage he ceased with the snake sacrifice and worshiped that master of speech [Brihaspati]. It is this great material illusion [mahâmâyâ] belonging to Vishnu that, because of the interaction of the material qualities [the gunas], causes misfortune, cannot be counteracted and from which the souls who are part and parcel of Him become bewildered and are caught in material bodies. The visible illusory energy wherein abiding one lacking in peace thinks in terms of deceit, will not [prevail] when one constantly investigates what goes on in the soul. This is so because one therein, [in that state] the transcendentalists speak about, is not of the materialistic arguments that assume so many forms nor thereof is of a mind full of decisions and doubts. In that [transcendental consciousness] the living entity is not of worldly concerns or of their causes and the benefits achieved by them, nor is he therein of the I-awareness [that is so strong] in being bound to the modes. That is all excluded then. A wise soul should take pleasure in warding off the waves of worldly conditioning as also anyone thus being entangled [see also e.g. 6.4: 31-32]. The supreme refuge of Lord Vishnu is, by those who wish to give up everything inessential, designated as that what is 'neither this, nor that' [see also neti neti]. Rejecting the immorality [of materialism] and with their emotions directed at nothing else, they embrace in their hearts the 'not-that' [of the Soul, of Him] to which they hold on deeply absorbed in meditation [in samâdhi]. [Thus] not being corrupted by the 'I' and 'mine' that is based upon having a body and a home, they attain this supreme refuge of Lord Vishnu. Insulting words one should tolerate and one should never disrespect anyone, nor should one identify with this material body or hold a grudge against whomever. I offer my obeisances to Him, the Supreme Personality of Godhead S'rî Krishna whose knowledge is always new and upon whose lotus feet meditating I have assimilated this collection of wisdom [Samhitâ]'." S'rî S'aunaka said: "Please tell us this oh gentle soul [Sûta]: in what way spoke Paila and the other highly intelligent disciples of Vyâsa who constitute the Vedic authority, about the Vedas and how have they divided them?" Sûta said: "Oh brahmin, Lord Brahmâ, the most elevated being, had his mind perfectly under control and heard in his heart the subtle transcendental sound [of ta-pa, 2.9: 6] that arose from the ether. One can hear that sound when one closes one's ears [for sounds from the outside. See also s'abda]. By the worship of that sound, oh brahmin, yogis cleanse the contamination away from the heart that is known as the substance, the activity and the doer [**], and find liberation from rebirth. From that [sound] the threefold omkâra [A-U-M] came into being that, manifesting itself unseen, constitutes the representation of the Supreme Lord [Bhagavân], the Absolute Truth [Brahman] and the Supersoul [Paramâtmâ, see also 1.2: 11, B.G. 7: 8]. One perceives this [eternal, itself imperceptibly manifesting] sound, outside the physical sense of hearing and power of vision. The complete of the Vedic sound one employs is an elaboration of this omkâra that from the soul manifests itself in the ether. It constitutes the direct expression of the self-generating Absolute Truth and Supersoul, it constitutes the eternal seed of the Vedas and constitutes the secret of all mantras [see also 7.15: 31, 9.14: 48, 11.14: 34-35, 11.21: 36-40]. Oh eminence of Bhrigu, the three sounds of the alphabet beginning with A that came into being [the sounds A, U and M], are fundamental to [all] the threefold forms of material existence: the modes [the gunas], the names [of the three Vedas], the destinations [the three types of lokas] and the states of consciousness [avasthâtraya]. The mighty unborn Lord [Brahmâ] created from it [that threefold sound] the different sounds of the total collection of vowels, sibilants, semivowels and consonants as they are known by their short and long forms. For the purpose of giving instruction on the four sacrifices [see ritvik], the almighty one created with all these sounds from his four faces the four Vedas, along with his omkâra and vyâhriti invocations [of the names of the seven lokas]. He taught them [as a complete set] to his sons who were the great rishis among the brahmins most expert in the art of Vedic recitation, and they in their turn imparted them as instructors of dharma [âcâryas] to their sons. Throughout the four yugas generation after generation, one after the other disciple fixed in his vows received them [these Vedas] by disciplic succession [paramparâ]. They were divided among the prominent sages at the end of Dvâpara-yuga. 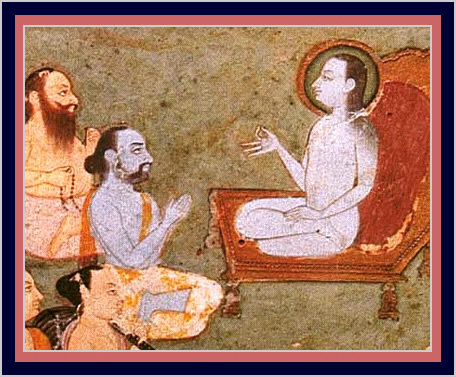 The brahmin sages, inspired by the Infallible Lord situated in their hearts, came to that dividing among each other of the Vedas when they saw that under the influence of time the intelligence [of the people] diminished, the life span shortened and the strength weakened [see also 1.4: 16-18]. Oh brahmin, in this period [of Manu], Brahmâ and S'iva and other rulers over the worlds requested the Supreme Lord, the Protector of the Universe, to protect the principles of religion. Oh most fortunate soul, the Lord [in the form of Krishna Dvaipâyana Vyâsa], by Parâs'ara begotten in the womb of Satyavatî, then descended as a partial expansion of His plenary portion [Sankarshana] and divided the Veda in four. Like someone sorting out gems, he separated the group of mantras in four categories of collections [Samhitâs]: the Rig, Atharva, Yajur and Sâma Veda [see Vedas]. The highly intelligent and mighty sage, asked four of his disciples to approach him one by one, oh brahmin, to give each of them one of the [four] collections. He taught Paila the first collection [the Rig Veda] named Bahvrica ['many verses'], to Vais'ampâyana he spoke the collection of Yajur mantras called Nigada ['the recited'], the Sâma mantras titled Chandoga ['singer in metre'] he told Jaimini and the [Atharva] mantras from [the sages] Atharva and Angirâ he entrusted to his dear disciple Sumantu [see also 4.21: 22]. Paila told his Samhitâ [that he divided in two] to Indrapramiti and Bâshkala. The latter one oh son of Bhrigu [S'aunaka], divided his collection in four parts he handed down to his disciples Bodhya, Yâjñavalkya, Parâs'ara and Agnimitra. The self-controlled sage Indrapramiti taught his collection to the learned seer [his son] Mândûkeya and his disciple Devamitra taught it to Saubhari and others. S'âkalya, his son, divided his collection in five parts he gave to Vâtsya, Mudgala, S'âlîya, Gokhalya and S'is'ira. Sage Jâtûkarnya, also a disciple of his added to the collection he received a glossary when he passed it down to Balâka, Paila, Jâbâla and Viraja. Bâshkali [the son of Bâshkala] assembled from the different branches [of the Rig Veda] the collection called the Vâlakhilya-Samhitâ that was received by [the daitya sons] Vâlâyani, Bhajya and Kâs'âra. This is how those many collections of the Rig Veda verses were maintained by these brahmin seers [in disciplic succession]. Anyone who hears about the distribution of these sacred verses is freed from all sins. [Some] disciples of Vais'ampâyana were known as the Carakas ['the ones vowed'] for they executed a vow on behalf of their guru to atone for the sin of having killed a brahmin. They became authorities on the Atharva Veda. The son of Devaratâ then regurgitated the collected Yajur mantras. After he had left the sages greedily looked at these Yajur mantras and turned into partridges picking them up. These branches of the Yajur Veda thus became known as the most beautiful Taittirîya-Samhitâ ['the partridge collection']. Oh brahmin, Yâjñavalkya, looking for extra mantras unknown to his spiritual master, thereupon carefully worshiped the Lord of the sun. S'rî Yâjñavalkya said: 'My obeisances unto the Supreme Personality of Godhead, who, appearing as the sun and just like the ether in the form of the Supersoul inside and in the form of Time outside, is present in the hearts of the four kinds of living entities beginning from Brahmâ down to the blades of grass [as born from wombs, eggs, moist and seed, see also 2.10: 37-40]. You who cannot be covered by material terms, all by Yourself, with the flow of years made up of the tiny fragments of kshanas, lavas and nimeshas [see 3.11: 7], carry out the maintenance of this universe by taking away and returning its water [in the form of rain]. Oh Lord of the Sun, oh Glowing One, oh Best among the Gods, by the rules of the sacred tradition I daily meditate, at the [three] junctures of the day, with full attention on Your glowing sphere, on You the mighty controller, who burn all the sins, the consequent suffering as also what led to them, of all souls offering prayers [see also 11.14: 35 and the Gâyatrî]. You, who in this world are the Lord dwelling in the hearts of all the moving and nonmoving living beings depending on Your shelter, awaken [and inspire] their unconscious material mind, senses and different vital airs [the vâyus]. This world was seized and swallowed by the horrible mouth of the python known as darkness and became unconscious like being dead. You alone, most magnanimous mercifully casting Your glance, awaken [the sleeping souls] with the gift of insight. At the beginning, half way and at the end of the day You thus, day after day engage [the pious] in the ultimate benefit known as one's own nature of delivering service in a spiritual existence [svadharma]. Like an earthly king You [in the form of the sun] travel around everywhere creating fear among the sinners while the deities of the directions holding lotus flowers, with folded palms offer their respects. Hoping for Yajur mantras not known to anyone else, I therefore with prayer approach Your two lotus feet, oh Lord, that are honored by the spiritual masters of the three worlds [lokas, and see 5.23: 8].' "
Sûta said: "He, the Supreme Lord of the Sun thus glorified being satisfied, assumed the form of a horse and presented to the sage the Yajur mantras that were never learned by any other mortal being [see also 5.18: 6]. Of Jaimini Rishi, the manager of the Sâma Veda, there was a son Sumantu as also a grandson Sutvân. Each of them he told one half of the collection. Sukarmâ, another disciple [of Jaimini] and great thinker, divided the tree of the Sâma Veda into a thousand collections of Sâma mantras after which, oh brahmin, the disciples Hiranyanâbha - the son of Kus'ala - Paushyañji as also another one named Âvantya who was most advanced in spiritual realization, took charge of them. From Paushyañji and Âvantya there were five hundred disciples who are called the Sâma Veda singers of the north, or also [in later times, some of them] the singers of the south. Laugâkshi, Mângali, Kulya, Kus'îda and Kukshi, [five] other disciples of Paushyañji, each took care of a hundred collections of mantras. Krita, a disciple of Hiranyanâbha, communicated twenty four Samhitâs to his disciples and the remaining ones were handed down by the self-realized sage Âvantya." *: The S'rîmad Bhâgavatam is also known by the name of 'Paramahamsa Samhitâ': the collection of stories about the Supreme Swanlike Lord. **: The substance, the activity and the doer as impurities are understood as manifestations of the ego-inspiring modes of the ignorance of inert matter, the passion of movement and the goodness of knowledge, also known as the adhibhautika hindrance of the body, the adhyâtmika hindrance of the organs of action and the adhidaivika hindrance of the senses of perception [see kles'a]. The image of Parîkchit before S'ukadeva is a detail of the image used at 2.8. It is a Kishangarh painting of the Rajasthani school. India, 17th century. Source. "Yantra of Lord Vishnu with twenty-four Avatâras" by Vidya Devi and Dhirendra Jha . Source: Exoticindiaart.com, used with permission.